Merry Christmas to those celebrating on Earth and in Heaven. Thank you to everyone who entered the giveaways for my day on the 25 Days of Giveaways. And now the winners!! Giveaway #1 – $10 GC to My Forever Child -- Gottjoy! Congrats to all the winners!! If you are a winner please email me at caring4carleigh@yahoo.com. If I end up not hearing from someone I will choose a new winner. There is also a giveaway going on today at my Caring for Carleigh FB page. On Sunday I finally was able to get to the cemetery and put up Carleigh’s winter flowers. They are the same ones as last year but we used them again since they were still in really good condition. I did get a purple stocking for her too but the girls got a hold of it and it went missing. We’ve tried to find it but they must have hid it somewhere good. I’m sure it’ll turn up eventually. So far this season has been good emotionally. I’ve had a few moments though here and there. Christmas is my favorite holiday so I have always enjoyed this time of year. I know it is difficult for many who have lost children. We imagine them opening presents and having fun with family. We wish they could help decorate the tree and sing Christmas songs. We know the holidays would be so much brighter if they were here. I hope that during this time of year that everyone can find something to bring them a little joy. 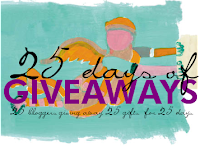 This is my 3rd year participating in the 25 Days of Giveaways and I’m excited to be doing this again. Thank you Tina at Living without Sophia and Ellie for hosting this wonderful event. I always jump at the opportunity to have a giveaway because I enjoy them so much! This year I decided to give away things from some of my favorite shops (in no particular order). My first favorite shop is My Forever Child. Sue has so many pieces to offer and if you don’t see something you like just let her know and she’ll work with you to create what you envision. (I’ve worked with her several times on pieces for my friends and she has done a fabulous job!) I have many pieces that I have come to cherish from here, especially my custom hand/footprint jewelry. I’ve also given away many pieces here on this blog. I believe that every mom should have a piece of memorial jewelry to remember her child whether it be a ring, bracelet, pin, or necklace. So I would like to give away a $10 gift certificate to My Forever Child. My friend Sue from My Forever Child has generously donated a Personalized Crystal Heart Ornament in gold. 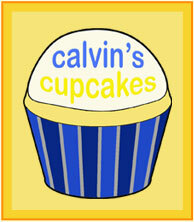 The front and/or back can be personalized with names, dates, scripture verse, or a special saying. It comes hung on a white satin ribbon. These are new this year in the shop along with several other ornaments. Thank you Sue! My friend Sue from My Forever Child has generously donated a Personalized Round Ornament in gold. This ornament features the My Forever Child signature baby feet in teardrop heart, image engraved into the ornament. The front of the ornament is engraved in Cursive font with, "So Softly You Tiptoed Into Our World, But What An Imprint You Left Upon Our Hearts". 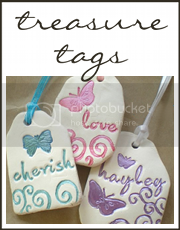 The back can be personalized with names, dates, scripture verse, or a special saying. It comes hung on a red satin ribbon. These are new this year in the shop along with several other ornaments. Thank you Sue! My second favorite shop is The Midnight Orange. D. Antonia is a wonderful sculptor and friend and her pieces are just gorgeous. I got my first piece back in 2009 but didn’t become an active collector until March 2011. I honestly don’t know why I waited so long because I love collecting them! I know many people who also admire her work but have yet to get one. D. Antonia has generously donated a $10 gift certificate to The Midnight Orange. Thank you so much!! My third favorite shop is owned by my friend Katy. She has generously donated a $10 gift certificate to her shop Somewhere Over The Rainbow. 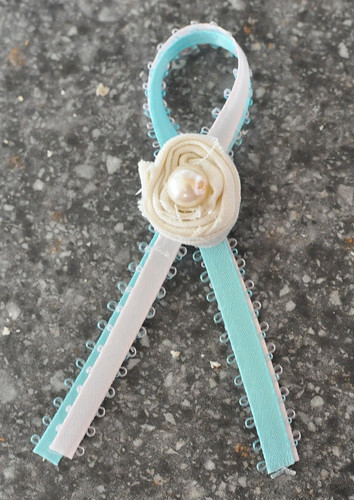 This shop offers a variety of items pregnancy and infant loss items and I personally have the Custom Baby Memorial Plaque and the Wooden Memory Box. Thank you Katy! My fourth favorite shop is Mountin Designs. 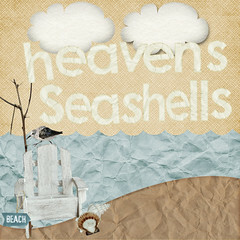 This shop has items related to loss such as memorial stepping stones, wall art, and ornaments. 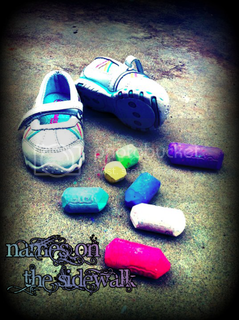 My personal favorite is the stepping stones. I just love them and one day I want to get one for myself. I am giving away a $10 gift certificate to Mountin Designs. My fifth favorite shop is MoonlightAura. Krystal specializes in sign language sculptures and her designs are very unique. She has several sculptures that I believe really reflect loss, such as her Heart-Shaped Hands Sculpts. Her Butterfly Landing Sculpture is also precious. One of my favorite pieces from her shop (and that I also own) is her I Love You sign language sculpture. I am giving away a pearl and a silver I Love You sign language sculptures similar to the ones picture below. My sixth favorite shop is Best Art Studios. I just love this art shop and while I haven’t bought anything for myself yet I definitely plan to in the future. Jaime’s art is so unique and beautiful and I just love the trees that she paints. Her line Heartache and Poetry is very moving and I find I can relate it directly to losing a child. (And I love it when they have their 50% off sales!) I am giving away a $10 gift certificate to Best Art Studios. These giveaways are open to all BLMs. You must be a BLM in order to enter these giveaways. To enter, just leave a comment with one of your favorite memories of your baby. I think during this season we all deserve to feel a little joy and I believe remembering something good does that. These giveaways will remain open until December 31st at 11:59 pm EST so that everyone in different time zones has a chance to enter. The winner will be announced the following day. Wishing everyone a gentle and merry Christmas. Today it has been 9 years since I made the choice to end my pregnancy at the age of 19. I can’t believe that it’s been that long already. I don’t like thinking about that day very much because it is one of my lowest moments and not something I’m proud of. There’s so many emotions wrapped up in that decision and the aftermath of it. I could never put them all into words adequate enough to show people who have never experienced it what it is like. The whole experience opened my eyes and made me a less judgmental person. I became a girl with a scarlet letter and I still wear it. I’ll always wear it. I’ve often wished I could go back and make a different choice but then where would I be today? I don’t think I would be who I am right now and I am happy with the person that I am. All of my mistakes have shaped me and while I would adamantly call my abortion the biggest mistake of my life I am torn in wishing I could take it back and finding peace with my decision. I am in a good place though thanks to the bible study Forgiven & Set Free and God’s healing touch. While I still have regret and guilt, it does not consume me and I am so thankful for that. I remember when I was so weighed down by what I had done and how that felt and I never want to feel like that again. It didn’t feel like me. No matter how you lose a child, certain things stay with you-certain memories stand out. There is quite a bit that is hazy to me from that time but I’ll never forget walking in and then out of that clinic. I felt shame and relief. Such an odd mix of emotions. There was a period of time (5 years to be exact) that I tried to forget it even happened, but you can’t push something like that away. I couldn’t forget my baby no matter how hard I tried. It was only after I became a mother to a living baby that I realized my first baby deserved more. My baby deserved a name so I chose the name Jordan Leigh since at that time I did not have a feeling if my baby was a boy or girl so I chose something gender neutral. Jordan most likely would have been born at the end of July. 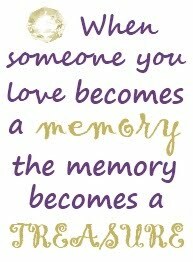 Today, I think of you, my sweet Jordan, and I’m wishing you a happy birthday in Heaven. I’m sure you were waiting with your arms open wide for your sister Carleigh. I imagine you two up there having so much fun together. I’m just glad you have each other until I can get there too. Mommy loves you. The day went fine and I actually didn’t think about it too much. I did reflect a little though. While I remember exactly what happened from my ultrasound on, I find it harder to remember all the emotions I was feeling then compared to 2 years ago or even last year. I guess that’s just a part of time moving on. Reading previous posts about that day help to remind me and I’m glad that I wrote it down. December 15th doesn’t hold the sting that it used to even just 3 years out but I will always remember this day every year it comes around. I could never forget the day our lives changed forever. One moment we were happy and excited about meeting another little girl and the next moment we were devastated that she’d never come home with us. Can you ever completely recover from that? It still baffles me how well I handled that day. I can’t explain it other than it was a God thing. I should have been a complete mess but I felt covered in calm, even though there were times I felt like screaming and crying. Don’t be mistaken, there were tears. Tears of shattered dreams. Tears for a life that would be cut too short. Tears of a momma’s broken heart. Those tears still fall today for my little girl. I never imagined when I woke up that morning that my whole world was going to change. But what if I did know? Would I change anything? I don’t think that I would. Changing something would mean changing my daughter and I just can’t imagine that. To me, she is perfect. Many people may not see it, but I see her with a mother’s heart. The love a mother has for her child is one of the deepest loves a woman can experience. I’m glad I got to experience that with her. Click the buttons to check out some of these Christmas giveaways and tutorials too! This week for Illuminate we searched for letters and then took pictures to make a word. This word is one we had to choose to be a theme for us in the upcoming year. The writing is about the future and how things might look say a year from now. I’ve learned that you shouldn’t worry too much about the future because your whole life can change in a moment. Plans you have made can take a totally different path than what you were expecting or wanting. I never thought that I would be where I’m at today. The facts are horrible to face. My daughter was diagnosed with a fatal disorder and she was born still over 3 months later. But when I read those words I don’t really see something terrible. I recall the precious time I spent with her, the memories we made, her day and night gymnastics in my belly, the joy I feel to this day of being her mom. I want to always remember these things. It doesn’t matter if it is a day, a month, or a year from now as I want to always be able to cherish the moment. Sometimes I don’t always do that but I embrace it more than I ever did before my daughter died. I want to always feel so blessed for what I have been given. They say God gives and God takes away. I do believe that to a degree but I find it hard to apply that to the death of my daughter. God did give me a beautiful daughter but I don’t feel He took her away from me. Maybe it’s because she really isn’t gone forever. She is just away from us for a time until we are reunited again. I hate that we have to have a lifetime apart but I look forward to the day when we are together again. Is there anything that I can change in this next year? Well, I can’t control many things in this life but the one thing I can control is myself and how I behave and react to situations and to people. In this aspect, I would like to do better. When thinking of a word that I might try to have as a so-called motto for the next year I had a hard time deciding. I know people who have done the one word thing but I never did it until this assignment. I guess I just didn’t like the idea of one word summing up who I would want to be. I think there’s so much more to me than what one word could describe. So I tried to think of a word that could encompass many different areas of myself. I came up with just a few but one stood out above the others: SERVE. There are many ways that I can serve. I can serve my patients at work, my family, my friends, those in need, and most importantly I can serve God with my heart. It isn’t always easy to have a servant’s heart though. My own selfish nature goes against serving others. But there is Someone I can model myself after who is the greatest servant who ever lived and that is Jesus. Jesus is the Son of God but He lived to serve others. He served people who many looked down upon without caring how He would be perceived. He loved others wholly and unconditionally with a pure heart. I want to serve like that. I think my daughter Carleigh instilled in me a will to serve. 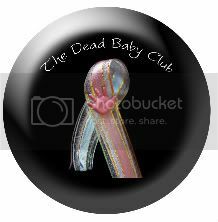 My own experience made me want to help others, especially other families who have lost a baby. I hope that in this next year to be able to serve in many more ways. - It is up to the partners to get in contact with each other and exchange mailing addresses. - All items MUST be shipped by November 7th. There will be a follow up link up that partners may participate in to show off their gift on November 21st. I decided to join in with Angie at still life with circles and many others participating in the Spoken Word Blog Round-up. To me it seemed like a pretty good idea. It’s always fun to hear the voice speaking the words you usually only read yourself. I think it’s neat to see how the voices are different or the same to what you imagined. I decided to share a poem from a post. I thought I’d have a few minutes to get it in after I picked up the girls from the sitter. Kyndra was playing with dinosaurs at the table and I had Lainey drinking a bottle. Should’ve known one of them would slip in the video. I decided not to re-do the video as it was most likely to happen again and why edit real life, right? This is me and this is what you get! I’m sure many out there in this community know about Carly and Franchesca and their collaboration with the card line Lost For Words. Each of them makes fabulous cards dealing with the loss of a child. They also happen to make calendars too! Each of them have made a calendar for 2012 and both have been unveiled recently and available for purchase. Before the unveiling they asked for quotes from babyloss parents and I submitted mine. I was so excited to find out that Carly had picked my quote for the calendar. My month is the June and I simply can’t wait to get one of these calendars to have in my house. I actually came up with the quote 2 years ago when Kelly was asking to remember our babies for Pregnancy and Infant Loss Remembrance Day. 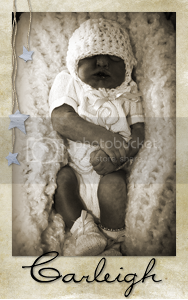 We could include a small quote for our babies and that is what I came up with for Carleigh. Thank you Carly for choosing my quote! And thank you both for creating such a beautiful line. You can purchase Carly’s calendar HERE and Franchesca’s calendar HERE. Sunday evening (October 16th) we stopped in Merrillville, IN to stay the night. In the morning, we stopped at a nearby McDonald’s so that I could meet up with my friend and fellow BLM, Dana. I actually met Dana through The Midnight Orange FB page. While we waited for her to arrive, we got some hashbrowns. Once Dana arrived we talked for a bit before it was time to hit the road again. It was so great to meet her! I just love meeting my online friends. Thanks for meeting up with me, Dana! Wouldn’t it be nice to have my own private jet so that I could travel around the country meeting all my BLM friends!! That would be so awesome! Please click the box below and sign the petition to expand FMLA coverage to include employees who have experienced the death of a child. As we all know, parents need as much time as they can get to grieve and current bereavement leave is simply not enough time. My work allows for up to 5 days off for bereavement. If I hadn't had my maternity leave for Carleigh to be off 6 weeks I don't know how I would've handled going back to work so soon. I don't believe I would have been in any shape to go back just 5 days after losing my child. So please help out!! Here is the pamphlet from the memorial that evening. I unfolded it and scanned it. You can click to make larger. The first event of the evening was at Levee Park in Red Wing, MN. We had a balloon release there. The next event was the lantern lighting at Central Park in Red Wing. Once we arrived we enjoyed listening to some songs. Not long after the ceremony started everyone went up and lit them. I got both a lantern and a luminary for my babies Jordan and Carleigh. I took a picture of Heather and her family. I couldn’t help but notice the Comfort Bear from Sufficient Grace Ministries. I really like this photo that Heather’s daughter took. Towards the end of the ceremony it was time for the speakers, which meant it was my turn!! I admit, I was definitely nervous. I have never spoken in front of anyone sharing our story of Carleigh. Anthony says he could tell I was nervous but I eventually settled into a good rhythm. It prolly didn’t help that I was a little chilly! The air wasn’t real cold but there was a crisp breeze that evening. A couple parts I got a little teary but I made it through! I’m so glad that I got to share. After I shared my story it was Amanda’s turn and then Sherokee Isle spoke. 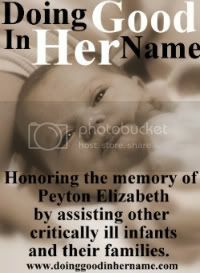 If you’re not familiar with her she wrote the book Empty Arms: Coping After Miscarriage, Stillbirth, and Infant Death. I haven’t read the book but I am sure it is good. She was good at speaking and we were all glad that she had decided to join us that evening and speak. I even got to speak with her after everything was over and I felt better when she said I did a good job speaking. Wanted to share also a pamphlet about the support offered by Anchored By Hope.